the SSC-1500 dual-microprocessor-based control system and the SSC-3000 solid-state press-automation control system, both of which comply with OSHA regulations and ANSI safety standards. The SSC-1500—with a large, user-friendly keypad/display—finds use on part-revolution-clutch power presses and press brakes. Redundant inputs from devices such as palm buttons, foot switches and light curtains provide control reliability. 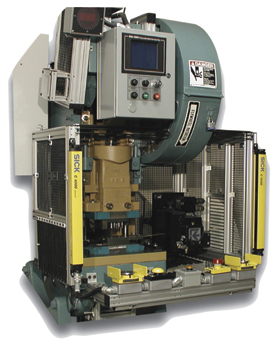 The SSC-3000 control, also for use on part-revolution-clutch mechanical power presses, is a rack-mounted modular control with expandable options that allow a metalformer to add or delete features as requirements change.